This page does not refer to a manufacturer but rather describes a company that mined kaolin and other vital products for the porcelain industry. It is mentioned here because it belonged to a group of companies that included various other providers and at least one manufacturing factory, so I thought that some people might want to know a little more about it. Between 1780 and 1790 the locals had started first attempts to produce porcelain based on the available raw materials of kaolin and feldspar in the Karlsbad region and between 1805 and 1810 the small firms of Jacob Lorenz and Kaspar Pfeiffer started their mining operations in Zettlitz. While the first years of mining operations were dominated by a large number of small family-owned firms, the expanding regional porcelain industry as well as the slowly starting export business to Germany created a rapidly growing industry that could only be covered by companies with enough financial resources and advanced technology. Founded in 1892 and registered in the main town of Prague, the company also registered its first trade mark on November 11th 1892. As can bee seen in the marks section, the basic trademark remained unchanged over time despite all successive changes of organisation and ownership. During the next few years up to 1912, the Zettlitzer Kaolinwerke absorbed the smaller firms of Zebisch & Pfeiffer as well as Jacob Lorenz and Rudolf Gottl. As business expanded, they also acquired the combined porcelain manufactory/kaolin supplier Karlsbader Kaolinindustrie G.m.b.H. in the town of Merkelsgrün (today Merklín). The greatest event in company history however was still to come: during the International Congress of the IUPAC in Kopenhagen in the year 1924, the products provided by the Zettlitzer Kaolinwerke were declared the international standard, meaning that all other kaolin suppliers worldwide were from then on (and even today still are) rated in comparison to the kaolin found in and around Zettlitz. Business of course drastically increased and between 1927 and 1932, the company was able to take over further companies in the Karlsbad region as well as in Saxony (Germany). Until 1937,	the company included nine worked mines, ten washing plants, two brickyards, an own coal mine and of course the porcelain factory in Merkelsgrün that had been refitted to produce technical porcelain only from 1926 onwards. During World War II however, the whole porcelain production and kaolin mining industry in the region was brought to near collapse as former customers and tradelines were cut off or destroyed. As a direct result, not only the Zettlitz enterprise was in danger and following the nationalization of all mining companies in 1945, kaolin mining in the Karlsbad region and clay mining in the region around Cheb was merged in a joint national enterprise, the Joint Zettlitz-Wildstein Kaolin- and Clayworks on January 1st 1946. Slowly reestablishing their former business relationships, the now nationalized company slowly increased the annual output again. A few changes in the structure of the organisation followed from around 1950 onwards, mostly adapting changes regarding the responsibility for various sub-companies. This of course also included the loss of the factory in Merklín, which as a manufacturer was reassigned to be supervised by Electroporcelán Louny in 1958. On January 1st 1967, the company was renamed to Company for Ceramic- and Glass raw materials, Sedlec near Karlovy Vary; luckily the name was mostly abbreviated 'K.S.N.P.' (Keramické Sedlec n.p.). 'Sedlecké doly spol. s r.o. ', company for striping and mining of deposits in the Karlovy Vary region. This whole structure was completely integrated in the Czechoslovakian Ceramics Works association in Prague, which united most ceramic producers and suppliers of raw materials in Czechoslovakia, similar to the Závody silnoproudé elektrotechniky Praha which included the producers of technical porcelain. Later in 1970 the product range was extended by including mineral-based wall paints as well as a wide array of different plaster mixtures. Following the political changes in Czechoslovakia however, the company parts were divided. On December 1st 1990, the resulting independent state enterprise continued its work, now specialized on ceramic raw materials only. It was the main office responsible for the remaining plants in Božicany and Sadov together with the Sedlec mines and the Realization Centre; its internal structure however indicated that it was already planned to allow a seamless transformation into privatization later on. This was finally achieved after the split of former Czechoslovakia. On September 1st 1993, the company that was as known simply as 'K.S.B.' was officially privatized by means of a direct sale with no foreign participation. After a short period, the owners of the successfully expanding business started to restructure the company and its internal workflow, more and more adapting to western business models. 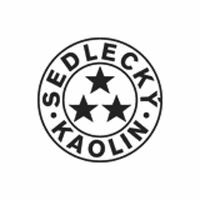 Around 2007, Sedlecký Kaolin had the status of being the largest supplier of high-quality kaolin for the porcelain industry with worldwide contracts and customers. 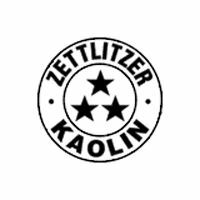 Logo of the Zettlitzer Kaolin company introduced 1892. 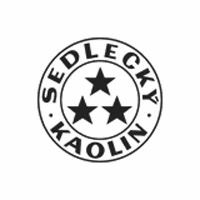 Sedlecý Kaolin logo introduced at the end of 1945. Logo of the Sedlecý Kaolin company introduced 1992 and used past 2007.